Girl, I hear you! But full lives are fun lives, right? Love Annabelle's pose in the blanket picture - Raley does that too, but with her other foot. And usually in her high chair. The toes go all the way to the mouth! And Annabelle looks so proud to be sitting up! How did our girls get to be so big? Boy howdy, is your girl a CUTIE! I still crack up with my little guy plays with his feet - and he's 14 months old now! Kudos on the blanket and on canvassing for Obama. We wanted to do that, but couldn't manage to figure out how to handle the little guy and knock on doors. You're a better woman than I! Tee, hee. 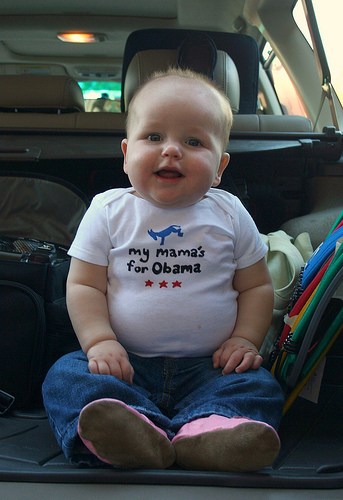 What a cutie (and nice t-shirt, too). oh my gosh, she is absolutely adorable! 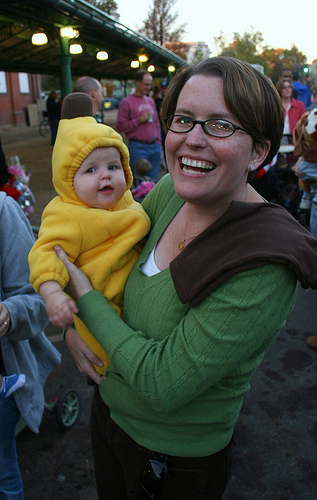 i love the banana costume and the obama shirt!!!! VA is going blue! Ништяяк! Добавила в закладки, буду вашим частым гостем.